How to escape all the other tropical holiday escapists? 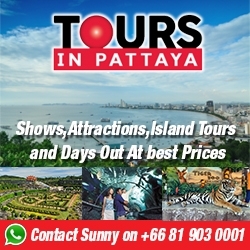 Try these two getaway routes on the Gulf, not far from Pattaya. I’m orbiting Koh Si Chang in a Skylab. Thailand’s famous tuk-tuk has mutated on this island not far from Pattaya into an odd beast that resembles a junked NASA space station. A Si Chang Skylab is a stretch three-wheeler with the nose of a motorbike and the lusty heart and lungs of an old Corolla. Like all good islands Si Chang has a story. Being only 120 km from Bangkok, it was a favoured hangout for Siam’s royals in the late 19th century. Kings Rama IV, V and VI used it as a weekender, often for pretty long weekends. They built palaces and gardens, with Rama V — Chulalongkorn — being the most prolific constructor. To borrow from Coleridge’s poem Zanadu, “In old Si Chang did Rama V a stately pleasure dome decree …” And today you can wander the beautifully restored terraced parklands, ponds and gardens that he created around his Chudhadhuj Rajthan palace. My Skylab trundles along the island’s narrow concrete paths with no worries about cars or trucks. There are none, just Skylabs and motorcycles. My pilot drops me at the Chudhadhuj Zanadu, amid the pavilions and walkways where Siam’s kings once strolled and Thai romantics still do. Nearby is Mai Rim Talay (“Wooden House by the Sea”), a photogenic green and white pocket palace that was probably a royal guesthouse. Today I’m looking out from it at a flotilla of bulk carriers, container ships and barges. Tranquil Koh Si Chang now sits in the middle of Thailand’s busiest shipping channel, just off Sriracha town and Laem Chabang port. “This used to be a fishing island,” says my driver. “But the Gulf has been fished too much.” Like many among Si Chang’s 5000 residents he now looks to tourism. Across the 25 sq km island I see numerous home stays. I’m staying at Somewhere, Si Chang’s newest and most stylish little hotel. With plenty of louvres and tiles in blue and white marine architecture, it has just 20 rooms, a pool, restaurant and the best Skylab on the island, a customized goer that you’d never call space junk. Surprisingly, given the island’s proximity to Bangkok, there is no escarpment of glitzy beachfront resorts. Si Chang has been “saved” from becoming a tropical tourist purgatory by its lack of good beaches. Its lone decent stretch of sand (and by Thai standards not a particularly flash one) is the narrow west coast strand of Tham Pang. I hire a motorbike and continue orbiting the craggy island. The sea is everywhere. Monitor lizards and free-range pigs wander the road. There’s a constant windfall of leelawadee, frangipani flowers. The streets are rubbish-free and the homes brightly painted. I head up to the white “Buddha Footprint” temple perched on a ridge overlooking the sea. From this here one can see survey a grand a panorama of islands and ships adrift between here and the Thai mainland, 12km away. Further south, the towers of Pattaya bristle on the horizon like a Cancun gone walkabout. So, what’s there to do on Koh Si Chang? Rattle around in a Skylab or motorbike. (Everyone leaves their keys in the ignition — with nowhere to run, there are no bike thieves.) Dine or have coffee in town or a sunset beer at the Chong Khao Khad viewpoint. Chat with the locals (there are very few foreigners). In short, there are no big deal, gotta-do-see-buy imperatives on snoozy Si Chang, a living, working Thai island. And that is its real attraction. On weekends escapees from Bangkok briefly swell the island population. But, come Monday, this fragrant island is yours again. Tamarind trees instead of bling bars, one 7-11, one bank and a fleet of Skylabs. What less could one want? Unsung Laem Mae Phim sits on the same Gulf coast as Koh Si Chang but in Rayong province well south of Pattaya and Koh Samet. With a shoreline of empty beaches, shade trees and a few food stalls, the Mae Phim peninsula is popular with weekenders from Bangkok but remains largely off the radar for foreigners. There are good offshore island dive sites and a selection of mid-range and upmarket resorts. One standout spot is the long beach beside Ao Khai (“Egg Bay”) fishing village. It offers, in the wistful words of Professor Henry Higgins, “an atmosphere as restful as an undiscovered tomb” — although a whole lot sunnier. The four-star Centara Q Rayong resort and its cheekily named Quicksand restaurant look out onto this balmy bay where two fishing boats, one kayak and a brown dog constitute a crowd. When you’ve done with siestas and beach strolls, Mae Phim allows several good excursions. In nearby Klaeng town visit the memorial to hometown hero (and Thailand’s “Shakespeare”), the prolific 19th century poet, Sunthon Phu. His epic poem, Phra Aphai Mani follows the romantic adventures of a Byronic hero across ancient Siam, including to Koh Samet. And while you’re in Klaeng, pay a visit to the unique KruKung Museum, a superbly curated, private exposition of mid-20th century Thai daily life. The museum’s faithful, period recreations of, for instance, a whole grocery shop, a 1960’s hair salon, school room, village cinema or complete rural café — all hitherto “unremarkable” environments — are now remarkable indeed.